You mentioned you are using StreamDevice to talk to your Tek scopes. I am having difficulties with the Probe Attenuator setting. So you basically change it say from 1 to 10, and the scope automatically changes the voltage on a channel from say 1V to 10V/DIV. I don't want StreamDevice to poll the scope once a second (or even worse I/O interrupt) to get this change (wanna leave it Passive), so I can change my Attenuator PV (Passive record) it then forwards the CHx_Voltage to ask the scope the current Y-axis resolution. The problem is that the AO record can be either closed-loop (via db links) or open-loop (via CA). On the screenshot is my HMI (http://imageshack.us/photo/my-images/337/scope.jpg/). 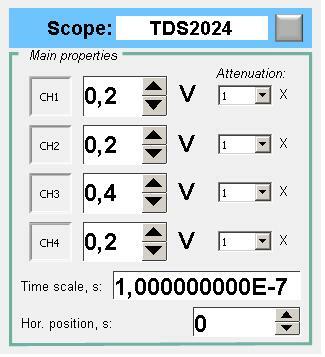 So when I change the Attenuator_1 setting (probe_ch1) from 1 to 10, my CH_1 voltage (setY1) remains the same = 0,2 V, when in fact on the scope it is 2 V. Is there a way my setY1 could update its value, but not process?